Remember my trip to the Treasure Island Flea Market? Well while I was there, I picked up a little over a yard of vintage fabric. This was my first time purchasing vintage fabric and I was looking forward to working with it. 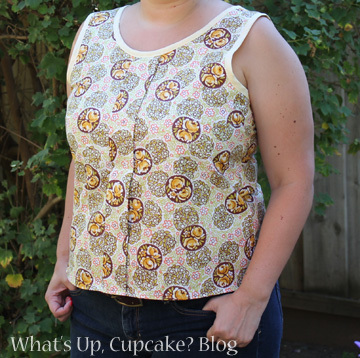 Colette Patterns released a free pattern for the Sorbetto blouse. Only two pattern pieces and about a yard of fabric needed - perfect! After I washed and ironed out my fabric I noticed a couple of spots with some age and wear. 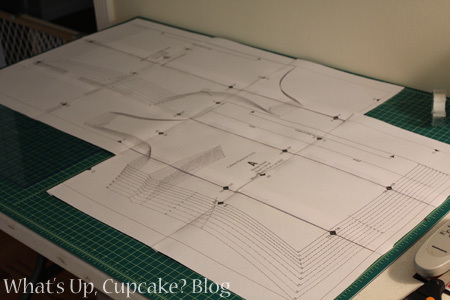 I kept inventory of those spots when it came time to cut out my pattern. Alas, as I was stitching the front and back together, I found one more small hole that I hadn't noticed. This required me to take in one of the sides about an inch, so I had to adjust the corresponding side to make sure the center pleat was still lined up. In the end, everything worked out fine! If I made it again, I'd make it a little longer and maybe add a collar like some other bloggers have done. Alas, it was not a good hair day. You are left with just the blouse. Overall, it took me about an hour to whip this top up. It was such a quick and easy sew! Very cute! You are a wiz! I take forever to make things.